In a recent development, the Governor ESL Narasimhan inaugurated the much-awaited, route from Ameerpet to LB Nagar, metro-rail in Hyderabad. The 16-km long second phase of Corridor I on the eastern suburbs is city’s high populated area. While taking a metro ride the governor ensured the people to avail the metro-rail facility to stay away from the heat and hazardous air pollution. 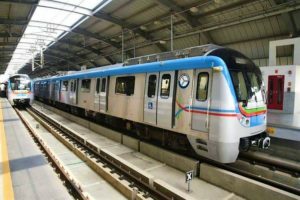 The other dignitaries who travelled in the metro from Ameerpet to LB Nagar along with governor were the state IT Minister K T Rama Rao and other officials. The inauguration route facilitating 17 stations is a crucial link between north-western and south-eastern part of the city. Speaking on the ongoing development process ensured by Hyderabad Metro Rail Limited (HMRL), HMRL Managing Director NVS Reddy said, HMRL is developing a heritage area enclosed by walls along with continuous and wide footpaths for the commuters on a 5-km between Police Control Room and Rangamahal Junction, stretching over five stations. The metro-link between Ameerpet to LB Nagar has been implemented to overcome all the mobility issues by ensuring smooth connectivity.